Successfully Added 301 Max Short Throw 2000 Lumen Projector - Android OS, 12000:1 Contrast Ratio, Keystone correction to your Shopping Cart. The 301 Max is an ultra short throw projector that will bring high definition viewing with images up to 200 inches. The 301 Max has the last say in home cinema short thro projectors. 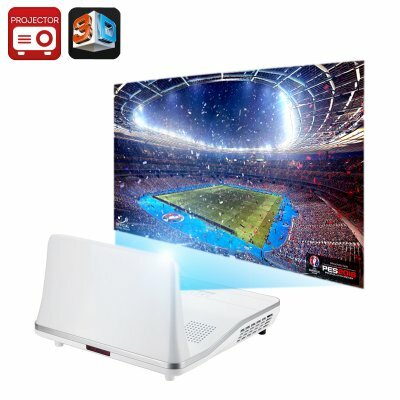 Supporting a maximum projection size of 200 inches and with an impressive 2000 lumens brightness this short throw projector will bring your movies to life with its 1200x800 resolution. Capable of turning your living room into an impressive home cinema the 301 Max supports 3D movies so all you need is the glasses and popcorn for your authentic IMAX experience right in the comfort of your home. This stunning projector employs a reflective image technique, so not only is it clear but it ensures no harm will be done to your eyes, even after long viewing times. Having multiple connection options such as USB 3.0, Bluetooth, Wi-Fi as well as HDMI, means you can easily incorporate laptops, tablets, Smartphone, speakers and controllers to this projector for a complete entertainment centre for all the family. The short throw projection and 40 degree keystone correction make it convenient and easy to use the projector, even in a small room or office as you won't experience pixelization or poor quality when projecting at short ranges. With an Android operating system you are able to support a wide range of formats making sure it can meet all your office presentation requirements, you can even download games from the Google Play store or stream movies thanks to Wi-FI and LAN capabilities. The 301 Max short throw projector comes with a 12 months warranty, brought to you by the leader in electronic devices as well as wholesale projectors..